The Skeleton Twins is a dramedy about two estranged, middle-aged siblings, who rekindle their unbreakable bond under dire circumstances. Together, they are forced to confront past demons, in order to pick up the pieces of their lives still plagued by the aftermath of tragedies. Not too often do I go into a film expecting greatness and exit completely flabbergasted afterwards. But here I am, beside myself in awe, finally having the privilege to experience the 2014 dramedy, The Skeleton Twins. 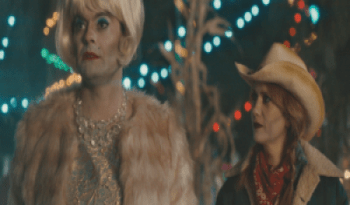 The ex-SNL powerhouse pair of Bill Hader and Kristen Wiig have constantly shown unwavering gifts in acting, begging to be fully unleashed. In this heartbreaking, yet, endearing suburban family portrayal, they harness their true potential. The performances will undoubtedly elevate their status, as top contenders of their craft, who can’t be pigeonholed into typecast roles. The story revolves around Milo (Bill Hader) and Maggie (Kristen Wiig). Estranged, middle-aged siblings, who are at a grief-stricken crossroads. They come from a broken home shattered by their father’s suicide when they were just kids. An untimely tragedy that latches onto them like an incurable disease and raises some serious questions about the possible heredity of mental health issues. They’re brought together after 10 years by almost sharing the same fate simultaneously. A failed suicide attempt by him and an abandoned one by her lands each at a hospital in Los Angeles. And their long history of crippling depression becomes apparent after Milo reluctantly accepts Maggie’s offer to stay with her in their small hometown of Nyack while he goes through his uphill recovery process. Of course, handling such heavy subject matter is no easy task. 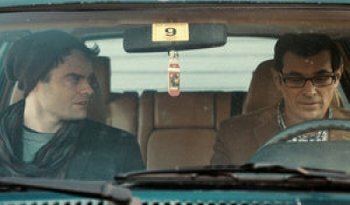 But miraculously, The Skeleton Twins leaves a radiant sense of hope instead of a sour taste of defeat. It’s a testament to how respectably sensitive and honestly written these characters are. Make no mistake, a film this strongly rooted in reality needs to be conducted with some tender care. For all the genuinely hilarious and warmhearted moments like this one, the rest packs a wallop. Thankfully, somber scenes are balanced without aimlessly paddling in a sea of disarray. And having rightfully won best screenplay at Sundance Film Festival—kudos to Craig Johnson—it’s all flawlessly on target. First and foremost, Milo and Maggie are survivors. It’s not to say they don’t stumble amazingly along the course of the 93 minute running time. But their ability to salvage humor from their lives, even in its most morbid forms, is something to applaud. Another cause for praise is the depiction of the inexplicable bond between real-life twins, since it’s a phenomenon not many understand, much less would dare to try to replicate. Nevertheless, Hader and Wiig’s onscreen chemistry is authentically fascinating to the point it’s hard to believe they aren’t related. It’s also worth mentioning how their sympathetic charm is what makes their characters feel so human. The siblings are far from bad people, but they’re tattered and torn individuals. This manifests into self-fulfilling prophecies to repeat the troubled cycles of their upbringing. Sadly, the poor decisions made seem totally understandable, as their worldviews are twisted by the demons of their past. The self-implosions of Milo and Maggie derive from a seemingly endless source of disappointment, discontent, and disassociation with the people they’ve turned into. They do realize they could be better in their self-hating missteps. But the pain of their childhood, mostly told rather than shown, subconsciously implants sick ideas of deserved misery in their heads. Milo, for all his witty sarcasm and openly gay confidence, thinks he’s a failed actor who peaked in high school. It doesn’t help his psyche one bit by giving into a disturbingly inappropriate fling with his abusive former teacher Rich (Ty Burrell). Maggie, a short-tempered and cynically timid dentist, is afraid of revealing that she’s not ready for kids to her nurturing husband Lance (Luke Wilson). It doesn’t help her psyche one bit by having affairs she can’t grasp why she partakes in. These glaring flaws are exhibited in alcohol-fueled and emotionally rash judgments. However, it’s quite difficult to hurl the latter at the two, considering they’re such pitifully coerced victims. And that’s surely the fault of their mother Judy (Joanna Gleason). She briefly enters the fold, at the naive request of Milo, to illustrate how cold and selfish of an absentee figure she’s always been. These traits are implied to be the cause of pushing away and inevitably driving their father to suicide. It’s very clear her obliviousness has affected them gravely. It’s proven by their inabilities to create, maintain, or even pinpoint healthy relationships. The destructive actions they put on themselves and the ones they desperately try to love, no matter how tough of a pill to swallow, are a direct result of the poisonous pieces of work they’ve had to consistently face. The character arc of Milo and Maggie can be downright cumbersome at points, but that’s life. The story doesn’t sugarcoat or baby the viewer through that harsh realization. There’s highs, such as the two spending their favorite holiday, Halloween, playing dress-up down memory lane, as their father once did with them. There’s lows, such as burning bridges that push them to the brink, but ultimately set them free in a beautiful crescendo of unified solace. All in all, the underlying message to take away from The Skeleton Twins is no matter how bleak things can get, there’s always someone to pick you back up if you can’t muster the strength yourself. As dark as The Skeleton Twins does sound on paper, the immensely talented cast and crew still transcend it all with flying colors. In lesser hands, everything could’ve gone so horribly haywire in misrepresenting these characters and their plights. The outcome is certainly an astonishing anomaly these days. It stands as one of the most unapologetic and inspirational takes on those who overcome in defiance of the odds. If you choose to give it a whirl, you will be blindsided by the special power this realm of escapism offers to those most in need of it. And for the healing capabilities a story like this possesses, I cannot recommend a film of this caliber enough to you.